Tata Nelson Mandela was laid to rest in Qunu just after midday on Sunday. He leaves a nation in mourning but he also leaves a nation that knows too well that the struggle for all that he fought for has not yet been won. By KHADIJA PATEL. After his speech at the official memorial service at the FNB Stadium on Tuesday was widely criticised, President Zuma appeared more at ease on Sunday as he eulogised the late president. It was a humble address that aptly paid tribute to the people significant to Madiba’s life as well the defining moments of the late president’s life. Zuma’s speech struck the right tone for the occasion. “Your abiding revolutionary spirit will prevail on us to not rest, until the poor and the working class have truly benefited from the material fruits of freedom and democracy which you fought for,” he said addressing Madiba. 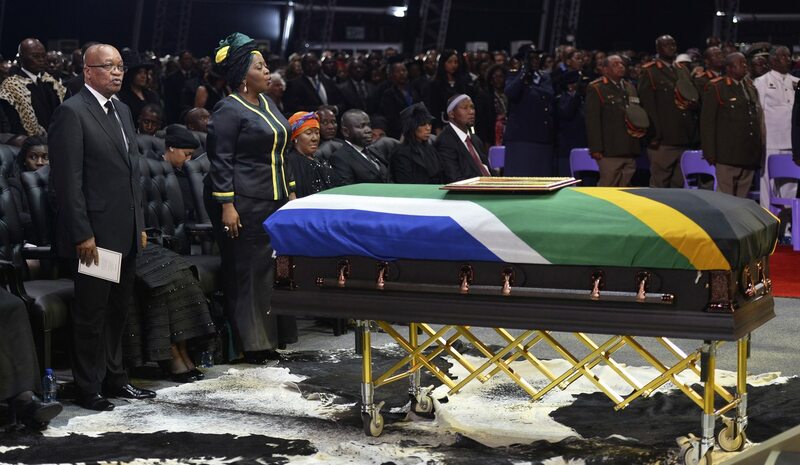 It was a funeral befitting the father of the nation, a funeral that encapsulated the great outpouring of emotion in South Africa over the last nine days. It was a service that hailed Madiba the revolutionary, as well as Madiba the family man. His granddaughter, Nandi Mandela recalled that Madiba was also a lot of fun to be around and was a great storyteller. She recalled that during family dinners, her grandfather would tell stories about his childhood, often poking fun at himself. Nandi also spoke of a strict grandfather, who sought the same discipline with which he conducted his own life in his family. “He was a disciplinarian who prepared us to be better people in our lives with or without him,” she said. She said like everyone who has been touched by him across South Africa and the globe, his grandchildren have also learnt valuable lessons from him. Earlier, ANC Chairperson Baleka Mbete dubbed it “South Africa’s first fully- fledged state funeral”. And while it was a funeral that encapsulated the life of a great man through words and song, there were expressions of sadness but there was also a common thread of joy. This was a celebration of a life well lived. But the most moving tribute was delivered by Madiba’s friend, comrade and fellow Rivonia Trialist Ahmed Kathrada. Kathrada said he last saw Madiba alive when he visited him in hospital and the late statesman tightly held his hand – “it was profoundly heartbreaking”. “How I wished I’d never had to confront the reality of what I saw,” he said. Tanzanian president Jakaya Kikwete spoke fondly of the role his country played in South Africa’s struggle for liberation, recalling the days of “Radio Freedom”, which brought tears to former president Thabo Mbeki’s eyes. Kikwete noted that not all that Madiba stood for has been achieved. He said it was foolish to think all the ills of the apartheid system can be corrected in 19 years. “A lot is still to be done, but the ANC government is doing it,” he said. His address, alongside that of Malawian president Joyce Banda, and the Ethiopian prime minister and AU chairperson, Hailemariam Desalegn, placed South Africa’s continuing struggles within a greater African context. Their speeches contributed to a ceremony that was, mercifully, free of controversy. Hardly a day has passed since the passing of Tata Madiba, Nelson Mandela, without some or other scandal titillating world headlines. On Saturday there was a scandal when it was revealed by the Desmond and Leyah Tutu Foundation, that the Archbishop Emiritus Desmond Tutu had not received an invitation to the funeral. Speculation grew rife that Tutu had been snubbed for his public criticism of the government. Eventually, sanity prevailed as Tutu was installed at the funeral in Qunu, with reports indicating that it was Minister in the Presidency Trevor Manual who ensured his attendance. Other reports suggest that another of Madiba’s friends and his former lawyer, George Bizos had also not been invited to the funeral and it was the intervention of Winnie Madikizela Mandela that assured his attendance. He admitted that many mistakes had been made through the course of the last week and thanked the various organisers of the funeral whose hard work was plainly evident in Sunday’s ceremony. And as Mandela was lowered into the grounds of Qunu, the words “Ufil Umuntu, Ufil’Usadikiza!”, “The person is dead but his/her spirit is alive”, is most apt. “These were the words that workers in January 1973 chanted when they marched through the streets of Durban at the beginning of the great Durban Strikes and the dawn of a new era,” the CEO of South African History Online said on Facebook on Sunday. And it is those words that best articulate the feelings of millions of South Africans, who must now carry the legacy of Mandela in all that they do as citizens of this country.